Why shouldn't you bother with Hungry Jacks vouchers in Perth? 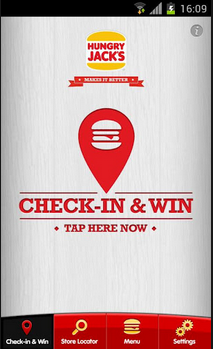 If you were wondering why people seem to be driving through Hungry Jacks without paying recently, there is a mobile app that is available for Apple and Android users which allows you to you "win" either a discount or a giveaway from Hungry Jacks every time you are within 1km of a store. Just shake your phone and the offer will appear. So what can you get from the app? Some people are concerned that every time you claim a freebie, it gets posted on Facebook. You can turn off the app's posting rights to facebook or you can restrict their check-ins to be "viewed only by me". You are only able to claim one item per store every 10 hours. Where can you get the Hungry Jacks app?